When Iona lands a job at the local stables, she meets the owner, Boyle McGrath. Cowboy, pirate, wild tribal horseman, he’s three of her biggest fantasy weaknesses all in one big, bold package. 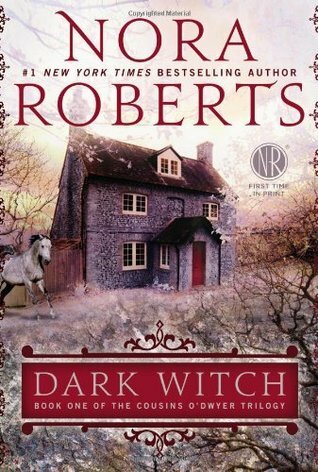 This was my first Nora Roberts book. I’m thinking maybe I should try another to see what everyone raves about. I enjoyed the setting and the world building. She did a wonderful job with the description of Ireland that I felt I could close my eyes and see the castle and the woods and all the beautiful places Iona went. The characters were just okay. Nothing that really made me particularly like them except the were likable characters but nothing that really made me love them and want to know more about them with the exception of Fin but I think that was because he was the odd magical one. The one who didn’t belong. The story was good. I’m always up for a good paranormal/witch/fantasy book. And this was decent but it just felt lacking in the background of the characters. The beginning she seemed to do a fantastic job drawing me in and holding me but after awhile It was all just okay. So as for my first Nora Roberts book I was kind of disappointed because I was excepting amazingness. I borrowed the next book in the series from an aunt so I’ll be reading that one as well, maybe this just fell under the first book in the series issue that I sometimes feel books have. Maybe I’ll try a different book series by her. Lets see, Great world building, okay characters, okay romance, decent story. Just felt a little lacking in places. The Call of Agon by Dean F. Wilson Review Tour!